In the midst of our crazy transition the 2 constants remain: Jesus and the OH-lympics! 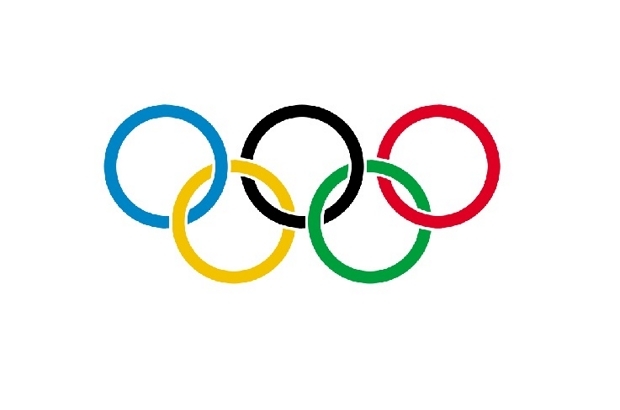 We LOVE the Olympics and have spent the past month or so in school preparing for the games. We’ve incorporated Language Arts, Social Studies, Math, and Science into our unit and it has been so much fun. The kids are learning and they don’t even realize it—which I love. 🙂 I thought I’d share some of our unit with those who are interested in doing some extra learning with your kids. It doesn’t matter that the Olympics have already started. They will be here for a whole 2 weeks! We started with a spiral notebook for each of them. They decorated it, of course, which needed no encouragement or instruction. 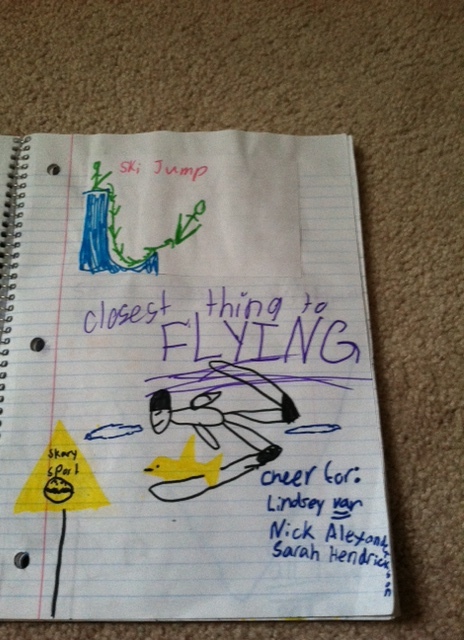 We slowly started filling in the notebook by devoting a page to each of the sports in the winter games. We found and read articles explaining the rules and guidelines for each of the events. We used the website nbclearn.com to watch videos on each of the sports that include the math and science behind each sport. Once there was an understanding on the event, they drew a picture to help them remember what it was and what some of the important characteristics were for each. We also read biographies online from the TEAM USA website and articles on the latest news from that sport. 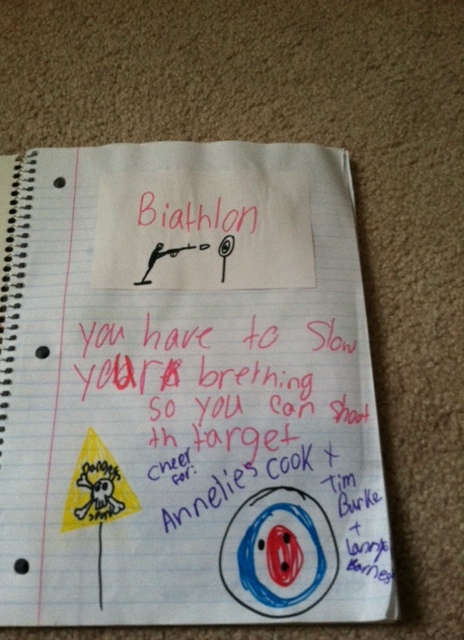 They picked the athlete that they wanted to cheer for and wrote it in their notebooks. For each of the sports, it was really great to see them searching out their own learning. They didn’t know it, but they were doing their own research project that involved reading, writing, science, and math. The first week of our unit just happened to be National Letter Week, so we learned/reviewed how to write a letter and they both chose to write a letter of encouragement to Lindsey Vonn, who at that time had just announced she would not be competing in the upcoming games. We hope to get a response! It was great to see them put forth the initiative to find the correct address for her fan mail. I think they envisioned seeing her opening and reading their letters on TV. They were a little misguided, but very motivated! We talked about how hard it must be to train for four years and then not be able to compete. We talked about how it would be a struggle for an Olympian or any athlete to put all their value and worth into their performance and success. We talked about good sportsmanship and humility and how that applies to all of us, even if we are not athletes. We discussed how so many athletes train and never make it to the games. So what happens to those people? We talked about how through Jesus we know we are more than athletes or artists or writers. We are children of God. We are His sons and daughters and that gives us more satisfaction and value than a gold medal at the Olympics. We discussed how sometimes God blesses people with medals and how that can be used for His glory, and how on the other hand, it can be a stumbling block and turn into an idol. Sweet Gideon suggested during more than one of these conversations that we pray for the athletes. So, Lindsey Vonn—you’ve been covered in prayer, thanks to Gideon. For a few of the sports we dove in a little deeper. They built a luge track down the stairs out of Zhu-zhu pet tracks and used Hot Wheels cars to test it out. They learned about friction and how it’s important to reduce it to have the fastest time. 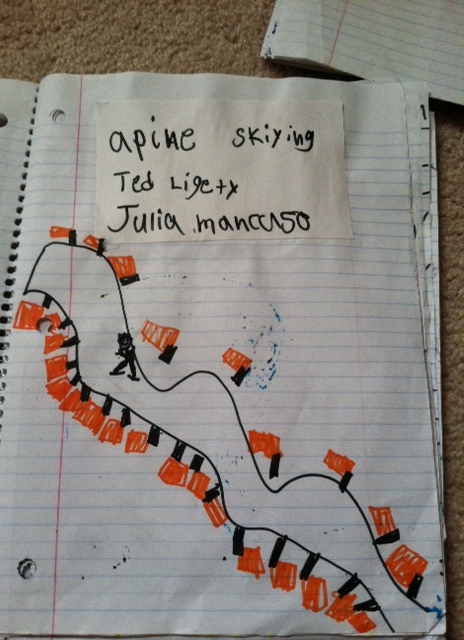 They learned about force and how the luger has one chance to apply force at the beginning of the track. They also learned how changing the grade of steepness of the track can accelerate or decelerate the athlete down the course and how that can result in a more or less challenging course. 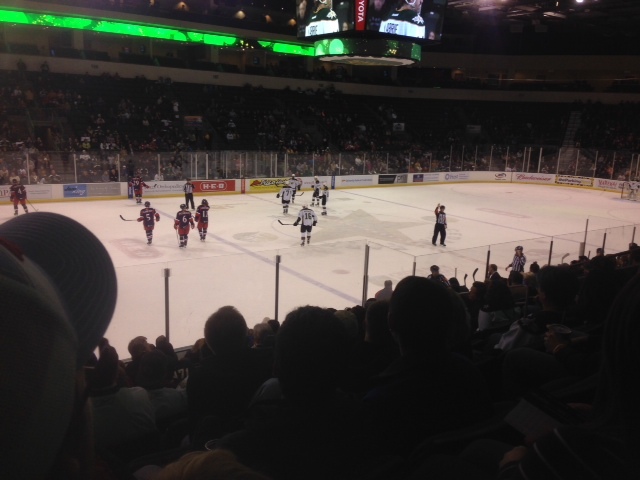 We also attended a Texas Stars hockey game. It was awesome. I didn’t know how they would react to all the body checks and if they would be able to stay engaged in the action, but they loved it and now our whole family loves hockey. It’s the hockey games they want to watch for the Olympics! Totally didn’t expect that! We also had a little history fun with some good movies. We watched Cool Runnings which is a comedy based on Jamaica’s first bobsled team and their journey to making it to the games. The kids loved it for it’s humor. I was encouraged when they again wanted to research the “real-life” Jamaican bobsled team. We read articles on the current team and how they were only able to make it to the 2014 Olympics in Russia due to monetary donations by fans. We discussed generosity and how one person’s sacrifice of money was able to contribute to a complete stranger reaching a goal. We also found youtube video of the first Jamaican team and their accident on the track. It really is moving to see the actual footage of the team walking down the track after the bobsled flipped in order to make it to the finish. Sometimes winning is not the goal, but completing a project. We also watched Miracle which tells the true story of Herb Brooks, the player-turned-coach, who led the 1980 U.S. Olympic hockey team to victory over the seemingly invincible Russian squad. There is a lot of good political history in the movie, which went a little over their heads. But, we learned from the movie about how being on a team means putting selfish ambition aside. 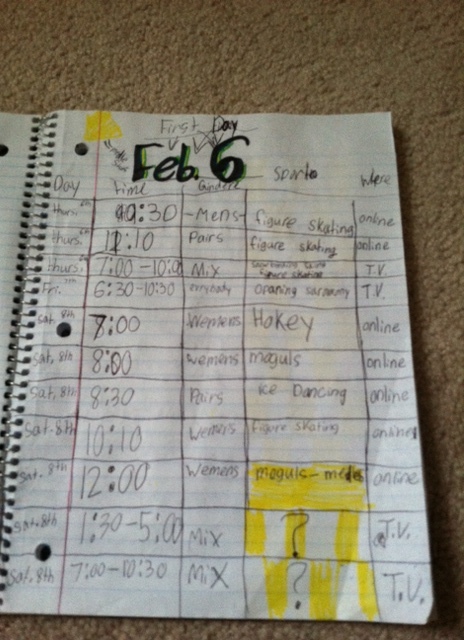 The girls researched the schedule of the games and made a chart in their notebooks of when the events will be televised so they could not miss a thing. It really has been the perfect unit for this crazy season in our lives. 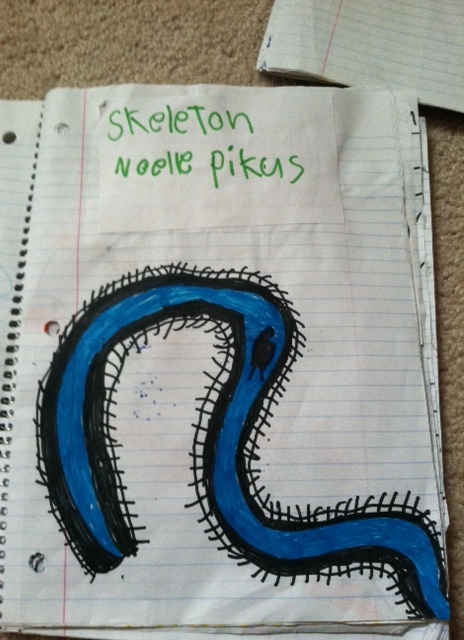 The notebooks make our unit very mobile which is great in the midst of packing and moving. It will be nice to spend the next two weeks watching the games and knowing that the kids are putting their research and new knowledge to work. They are so excited about following their favorite athletes and seeing if they can catch Vladimir Putin cracking a smile. (Try it…my bet is that he never will!) They will be keeping track of the medal count and the fastest speeds recorded on the skeleton, meanwhile learning how to fill in charts and graphs and plot lines. We will follow all the hockey games and create a chart that makes sense of the path and games needed to win to win a medal. 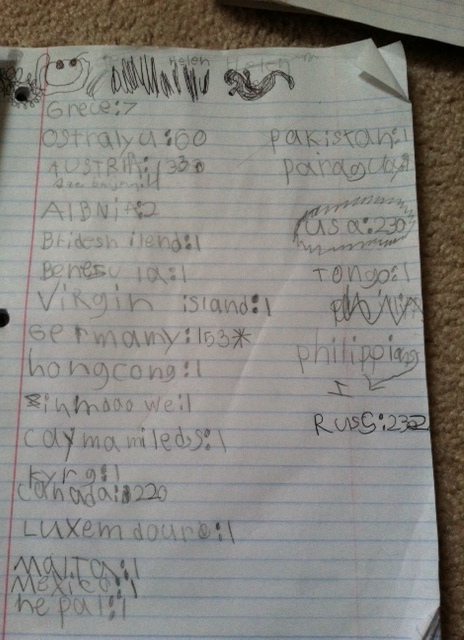 Following the Olympics we will use all of the data they collected to do some math problems and to do some writing. I hope that for those of you who love the Olympics as much as the Goeke’s, you have a fun family time around the games. I hope that you find yourself chanting “U-S-A” in your living rooms. I hope that it inspires conversations about value and worth and who we are in Jesus. I hope that your family and mine will get a bigger global view of the world and all the different people in it. I pray that we see God’s creativity in His creation and even more so a glimpse of the depth of His love for all of us. Woo-hoo! It’s the OH-lympics!